Don’t forget the Aerogard! l grew up hearing that both on TV and from my Mother and Father. Now l saw it to my kids and grand-kids. Seriously don’t forget the Aerogard, you may regret it. Those mozzies don’t discriminate. And with the airborne disease they carry now like Ross River Virus and others, it’s better to be safe than sorry. The only mozzie sprau that is a hundred percent reliable sofar that i have found. They didnt sell it in thailand and im so glad i packed it..
Aeroguard insect repelllent tropical strength we used to protect our skin on holidays.It is brilliant to keep the bugs away while we enjoyed ourself,excellent product! 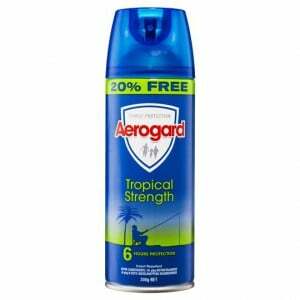 How would you rate Aerogard Insect Repellent Tropical Strength 20% Free?